Techniques to reduce livestock greenhouse gas emissions may also increase livestock productivity and resilience. These technologies are more likely to reduce the intensity of emissions, rather than total emissions, and so opportunities to benefit financially from creating offsets may be limited. We provide this information to support managers making economic, environmental and social decisions in response to climate change. In Australia, direct livestock emissions account for about 70% of greenhouse gas emissions by the agricultural sector and 11% of total national greenhouse gas emissions. This makes Australia’s livestock the third largest source of greenhouse gas emissions after the energy and transport sectors. Livestock are the dominant source of methane (CH4) and nitrous oxide (N2O), accounting for 56% and 73%, respectively, of Australia’s emissions. The amount of methane emitted by livestock is primarily driven by the number of animals, the type of digestive system they have and the type and amount of feed consumed. Ruminants are the principal source of livestock methane emissions because they produce the most methane per unit of feed consumed. Ruminant livestock (cattle, sheep, buffalo, goats, deer and camels) have a fore-stomach (or rumen) containing microbes called methanogens, which are capable of digesting coarse plant material and which produce methane as a by-product of digestion (enteric fermentation), which is later released by the animal through belching. Methane represents lost energy in the digestion process. It is estimated that 7–10% of a ruminant’s energy intake is lost to enteric fermentation, although it can be closer to 4% for feedlot cattle. Although non-ruminant herbivorous livestock, such as horses, do not have a rumen, significant fermentation does takes place in their large intestine, allowing the digestion of coarse plant material as well as producing a significant amount of methane. Pigs and poultry produce small amounts of methane as the result of the incidental fermentation that takes place during digestion. Measures to change enteric fermentation to reduce emissions may also increase animal productivity by increasing digestive efficiency. Reducing the number of livestock to reduce greenhouse gas emissions would be counter to the objectives of the livestock industry. Livestock industries are vital to many regional communities and earn around $18 billion a year with about $15 billion of this from export earnings, so it is important that any methodology that results in lower emissions also maintains or increases productivity. Note that some methods for reducing livestock emissions may lead to increased dry matter intake per animal or provide the farmer with an opportunity to increase stocking rates, resulting in either no net change or even a net increase in methane production. Farm modelling has shown that improving pasture quality and livestock efficiency can also improve productivity and lower emission intensity per unit of product, but the farm’s total greenhouse gas emissions may increase due to increased stocking rates. Understanding this concept is important for farmers considering participation in emission offset trading schemes. There are variations among animals in methaneemissions per unit of feed intake and these variations suggest that there may be heritable differences in methanogenesis (methane production). Trials suggest that animal breeding could achieve a 10–20% reduction in methane emissions. While breeding for reduced methanogenesis may not be compatible with other breeding objectives, breeding for improved feed conversion efficiency (lower net feed intake) should be compatible and is likely to reduce methane emissions and the greenhouse gas intensity of animal products. A range of dietary supplements and feed alternatives is being trialled to assess whether they can reduce methane emissions from livestock. Supplements being considered include oils, fats, tannins, probiotics, nitrates, enzymes, marine algae and Australian native vegetation. Methaneabatements of 10–25% are possible by feeding ruminants dietary oils, with 37–52% abatement achieved in individual studies. Plant secondary compounds, such as condensed tannins, have been shown to reduce methane production by 13–16%, mainly through a direct toxic effect on methanogens. However, high condensed tanins concentrations can reduce voluntary feed intake and digestibility. Plant saponins (natural steroids occurring in several plant families) also potentially reduce methane, and some sources are more effective than others, with methane suppression attributed to combating protozoal infections. There are approved methodologies for using dietary supplements to reduce greenhouse gas emissions from dairy cows and cattle. Improved forage quality with lower fibre and higher soluble carbohydrates can reduce methane production in livestock. Being structural fibres, cellulose and hemi-celluloses ferment more slowly than non-structural carbohydrates and yield more methane per unit of feed digested. Methane emissions are commonly lower with more forage legumes in the diet, partly because of the lower fibre content (faster rate of digestion) and in some cases, the presence of condensed tannins. As improved diet increases animal growth and reduces methane production, it has the effect of reducing the greenhouse gas intensity of the animal products. 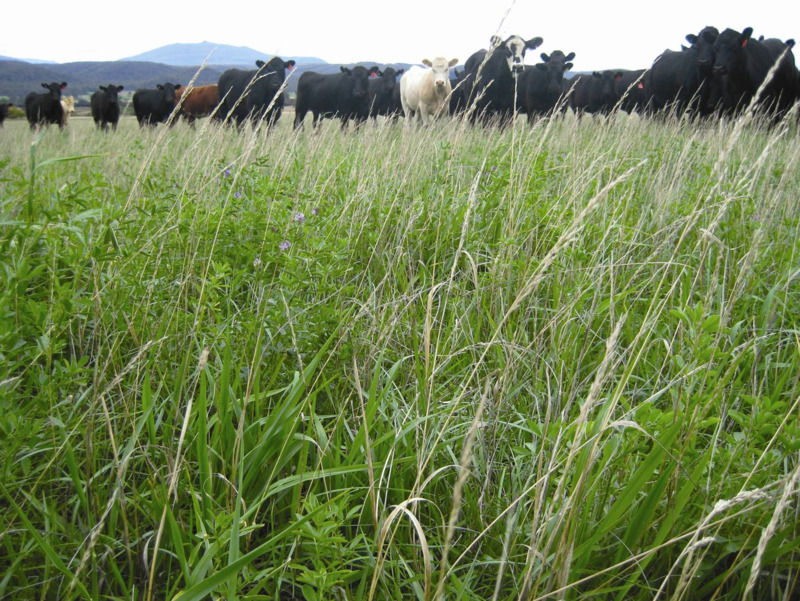 Pasture quality can be improved in several ways including by plant breeding, changing from tropical (C4) to temperate (C3) grasses that use different pathways to capture carbon dioxide, or grazing on less mature pastures. Several alternative plant forages, such as broccoli leaves and some native plants such as Eremophila glabra, Acacia saligna and a number of saltbush species, have been shown to reduce methane emissions in laboratory experiments. Research is ongoing to confirm these results under field conditions. There is an approved methodology for improving cattle pasture and pasture management to generate carbon offsets. Australian livestock emissions have declined since the 1990s. Although partially offset by a rise in beef cattle numbers, this decline has been driven by a fall in sheep numbers. Reducing the number of unproductive animals on a farm can potentially improve profitability and reduce greenhouse gas emissions. If productivity increases through nutritional and breeding strategies, the number of livestock can be reduced without losing the quantity of meat that is currently produced. Strategies such as extended lactation in dairying — where cows calve every 18 months rather than annually — reduce herd energy demand by 10%, and so potentially reduce methane emissions by a similar amount. With earlier finishing of beef cattle in feedlots, slaughter weights are reached at a younger age, with reduced lifetime emissions per animal and proportionately fewer animals producing methane. Trials involving mating replacement merino ewes at 7 months of age were successful in reducing greenhouse gas emissions by 9–12% through removing an age group of ewes that were previously not reproductive. There is an approved methodology for improving cattle herd management to generate carbon offsets. other microbes (methanotrophs) to break down the methane produced in the rumen into other substances. A fourth possible option — bovine somatotropin and hormonal growth implants — does not specifically suppress methane formation, but rather improves the animal’s performance and reduces the greenhouse gas intensity of the products.